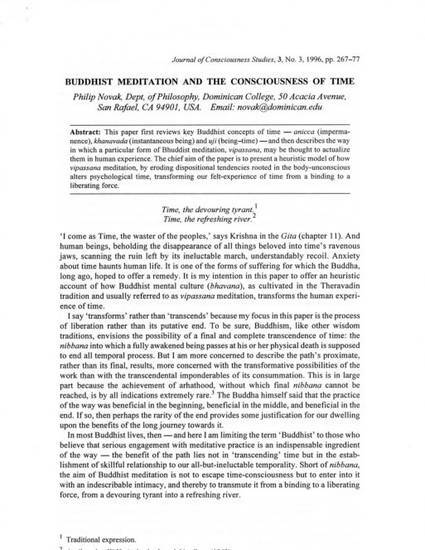 This paper first reviews key Buddhist concepts of time -- anicca (impermanence), khanavada (instantaneous being) and uji (being-time) -- and then describes the way in which a particular form of Bhuddist [sic] meditation , vipassana, may be thought to actualize them in human experience. The chief aim of the paper is to present a heuristic model of how vipassana meditation, by eroding dispositional tendencies rooted in the body-unconscious alters psychological time, transforming our felt-experience of time from a bind to a liberating force. Copyright © 1996 by Imprint Academic. All rights reserved.